After missing I don’t know how many weeks of Illustration Friday, cutting it a little fine as always — I managed it, just before the topic changed! 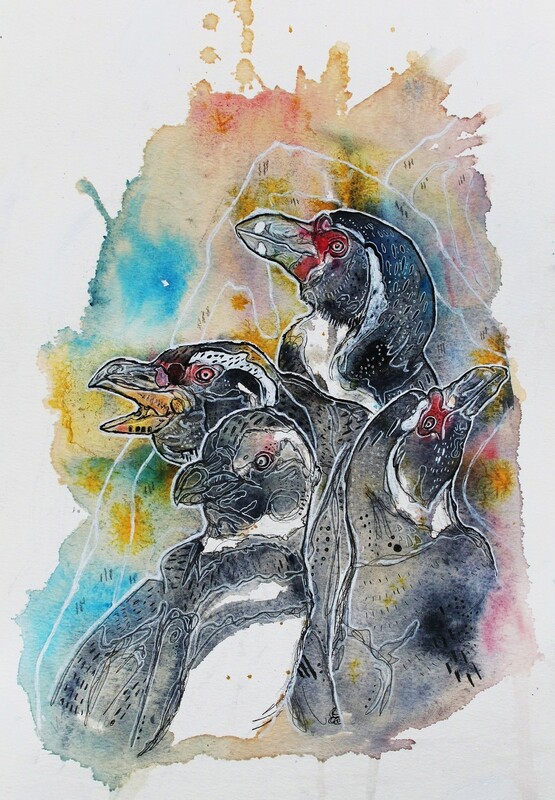 For the theme of ‘Together’ I thought about a bustling bunch of Magellanic penguins and for even more closeness I attached the penguins with an unbroken continuous line, how cosy! Then fought with a little bit of patterning, which I then finished with coffee, ink, watercolour and pigment. I was panicking a little as penguins look quite uniform with not a lot to distinguish one from another, I think I met the challenge reasonably well and managed to injected a little bit of individuality into each little penguin'ite, room for improvement though, definitely. September 27, 2013 by Laura Bennett.